dish and best use of the left over lunch preparation served the purpose of easy dinner . Made OPOS kurma for lunch following "kannamma cooks" recipe. 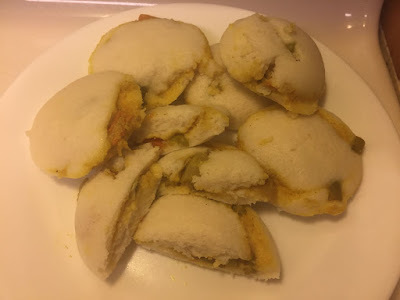 When the batter for Idlis was ready , thought of using the kurma as a stuffing and make soft idlis for dinner. For idli followed " tamilkitchen" recipe. Soak urad dal separately for 3 hrs. Keep soaked urad dal 1/2 hour in refrigerator before grinding. Grind dal smoothly, then grind rice and combine both in a large vessel. Beat well with the palm, add salt and ferment for 8 hrs or over night. 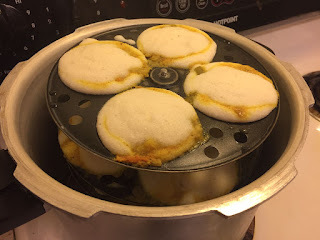 Boil water in the idlimaker/cooker outer, grease the idli moulds and keep. and again fill batter above the kurma. steam cook for 10 minutes on medium heat. remove idls after two minutes and serve. Note: Grind urad dal for not more than 25 to 30 min. Beating the batter with the fingers open wide, helps the fermentation. Before steaming the idlis make sure the water kept for steaming boils. Beat the batter before pouring into idli mould. Steam cook for ten minutes then wait for two minutes to unmould. Keep in a hot pack. This keeps the idlis soft n warm. After cooking for years I still feel there is much to learn. Aiming for a perfect dish is always desired by women. A change is always welcomed both for the one preparing and person eating it. I can recommend the above measures for making idlis. And it's accompaniments are always molaga podi, chutney and sambar.